Escoba - thanoscardgamess jimdo page! Escoba is a Spanish card game. The Spanish pack is used that has 40 cards. The objective is to get a determinated number of points, fixed before starting the game. 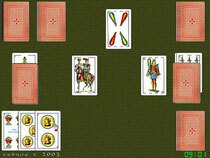 There must be played as many hands as necessary until some of the players reaches that score.The dealer shuffles the cards, gives the pack to the player in his left to cut it, deals 3 cards to each player starting by his right and finally puts 4 cards face up in the center of the gaming table. The leader makes the first move; every move entails to try summing 15, using one of his three cards and some of the uncovered cards on the table.When making the sums players should take into account the puntuation of each card: ace, two, three, four, five, six and seven counts like their index (1,2,..7); sota(10), horse(11) and king(12) count repectively 8, 9 and 10. When one of the players takes in his turn all the uncovered cards on the table it/s said to make an escoba (sweep); this is pointed out by crossing up face one of the cards in his own pack.